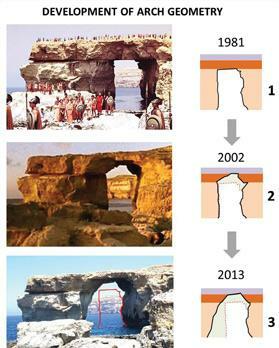 Gozo’s Azure Window is not facing imminent collapse but further erosion is “inevitable” according to a geological rock assessment unveiled by the Environment Ministry yesterday. The three-month study, conducted by local firm Geoscience Consulting Ltd, concluded that sea erosion did not threaten the window’s immediate structural integrity as had previously been postulated. Serious doubts over its stability were raised last year when a large part of the arch’s supporting side collapsed, significantly widening the iconic landmark’s ‘window’. However, the consultancy’s head geologist Peter Gatt yesterday insisted that the widening had not increased the arch’s length and had even reduced the mass of the pillar, not affecting its stability. “It is safe to say that the Azure Window is not facing any imminent collapse as was previously believed. This still doesn’t mean it will last forever – this is a process,” Dr Gatt said. The report estimates that the window is currently midway towards becoming a ‘stack’, which is when the arch collapses and leaves an independent rock structure similar to the Fungus Rock. Asked how long this process would take, Dr Gatt said it was a matter of decades. The report dismissed previous recommendations for long metal bolts to be inserted into the rock formation as this could cause serious damage to the soft rock layer of the arch. It said that, while the use of rock bolts would cause less damage, the “precarious location” of these blocks made it a hazardous solution. Dr Gatt advocated using no structural support mechanisms and instead called for crack meters to be installed along the structure to regularly monitor the progress of erosion. The Azure Window, one of 26 natural arches in the Maltese archipelago, is estimated to have developed over the past 500 years through sea and rain erosion. Dr Gatt believes the same erosion that formed the structure will also be responsible for its “inevitable” collapse. “Waves crashing against the cliff formed the striking window and they will also destroy it,” he said. Dr Gatt explained the window consists of two main rock layers: Upper Coralline Limestone, a hard, durable stone, and Blue Clay Limestone, a softer, malleable stone susceptible to erosion. As much as 90 per cent of the outer layer is estimated to have eroded over the past 30 years, but Dr Gatt maintains that the second layer will be less susceptible. The iconic feature is a frequent backdrop in tourists’ photographs and recently made it to the top 50 out of 350 natural formations vying for the title of eighth wonder of the world. Dr Gatt said that given the site’s delicate condition it should be reconsidered as a candidate for listing as a Unesco world heritage site. Addressing a press conference for the unveiling of the study’s results, Environment Minister Leo Brincat said the study was part of an ongoing effort to protect and maintain the island’s geological heritage. 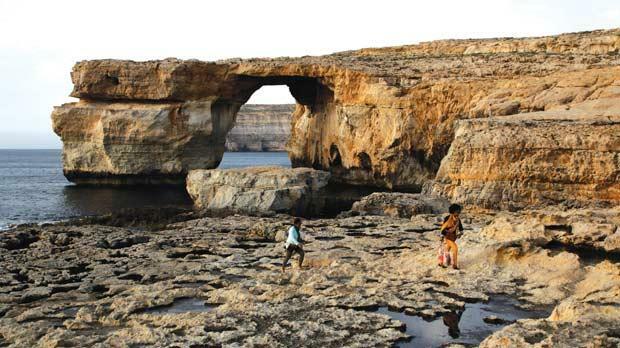 The report calls for the Dwejra area and the sister isle’s western coast to be transformed into a geo-park to preserve and study its geological architecture. The Dwejra area includes the Fungus Rock, the inland sea and the Azure Window. Mr Brincat said he would be meeting the Gozo Ministry to further discuss preservation of the island’s geology.